This week we are going to talk about how to make 10k in 10 days. I mean making ten thousand beautiful British pounds (or euros or dollars) in just ten days! Yes it is perfectly possible for anyone whether you’re self-employed, unemployed, freelance, in business, just starting out, or an experienced business owner. The magic of money is REAL and I’m going to teach you how to make £10,000 in just ten days. This might sound super counter-intuitive but it’s the fundamental step that most people miss out when trying to manifest extra cash. Declutter your house, your car, your wallet or purse… it’s even OK to declutter people from your life. You need to make space to allow new money to come flowing into your life. Filling your purse with old receipts instead of lovely crisp bank notes is sending the wrong message to the Universe! Rid your wardrobe of every item of clothing which doesn’t make you feel abundant, and cleanse the kitchen cupboards of cracked plates and glasses you don’t use anymore. Donate to charity and you’ll already feel a million times wealthier. There’s an art to decluttering. 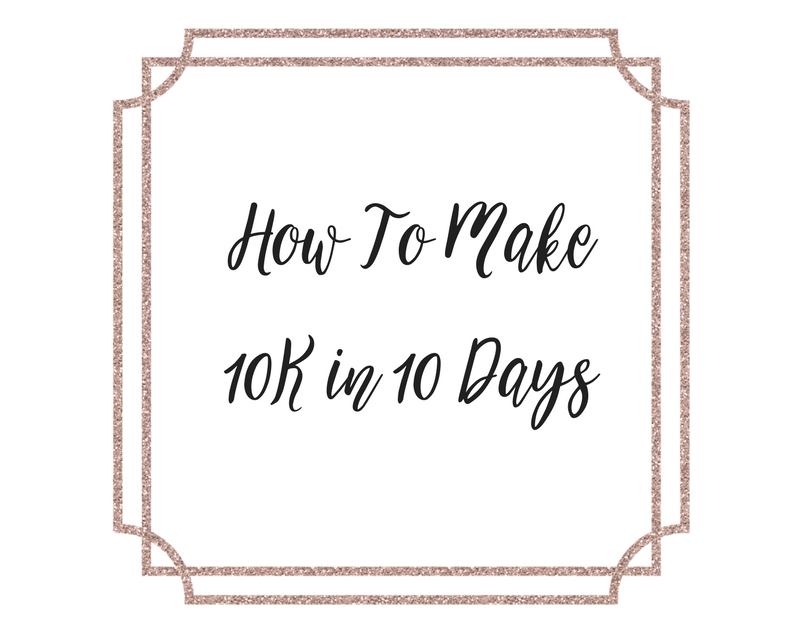 For more details, specifics, and WHY this is so important, check out the full ‘10k in 10 days’ course over here. Spend a day to do this… even it’s just one hour after work, it will make a huge difference. Better yet, take a whole weekend to clear the space ready to receive your 10k! What are you trying to achieve with your £10,000? Write down everything you intend to use the £10,000 for. Perhaps you don’t necessarily need the cash in your account immediately, and your intention here is to understand the process, and establish your own personal formula to creating a life of abundance. Whatever it is, write it down, and share with friends and family so they can help to hold you accountable. Mental preparation at this stage is crucial, especially if you’re new to making quick cash. Overwhelm, fear, guilt, frustration, and lack of self-worth are completely normal (and expected) feelings as you go through this journey. The key to overcoming these feelings is awareness. Once you shine a light on a shadow it disappears, and the same applies here. Awareness and self-care will prevent you falling off the 10k band-wagon! Credit to Gay Hendricks for this discovery… because this is where the magic really happens. Discovering your zone of genius, is the key to your own vault of abundance. When you are working and serving within your zone of genius, you don’t really even need to think about how to make the money… it just comes! Many of us don’t even realise we’re working outside of our zones of genius, we just plod on with life, doing whatever we can to make money to pay the rent. Once you shift this mindset and step into your power, life becomes effortless. Fortunately, I know many of you reading this are already tantalising close to stepping into your zone of genius. Musicians, dancers, teachers, healers, artists… you already know what your gift is, but what is it in particular inside of our gift that makes it ‘genius’. Which aspect of your gift is completely unique to you? Hot tip: It’s where life becomes effortless! What do you do effortlessly? Perhaps without even realising? Your zone of genius could be mothering, but more specifically coaching other mothers through the ‘terrible twos’ period. Your zone of genius in your full time job could be finding out-of-the-box solutions for a very specific demographic of customers. Your zone of genius in a period of unemployment could simply be self-belief and self-worth. Whatever it is, on day three, it’s your responsibility to figure it out, because once we have what is uniquely you… you have a genius to leverage in order to create your 10k! Hot tip: Watch the video above for more ideas. If you need help and guidance to figure out where your zone of genius lies, head over to the full ‘10k in 10days course’ so we can establish your new abundant journey.